Mecklenburg County LUESA is proposing dramatic increases to its Land Development, Zoning and Floodplain Permitting Fees for FY 2020, as it seeks to end a longstanding practice of supporting Land Development Services with excess stormwater fee revenue. The proposed increases, combined with the elimination of two vacant stormwater positions, will allow Land Development Services to cover 100% of its operating costs, says Land Development Director Dave Canaan. With the Town of Huntersville starting its own land development permitting operation this summer, the County's Land Development Services division will handle projects in the five remaining towns and the ETJ. The City of Charlotte charges separate fees for land development permitting within its boundaries. Both REBIC and the Greater Charlotte HBA have voiced our strong opposition to the proposed fees (listed below), which represent year-to-year increases of nearly 200% in some cases. Fees for multi-year projects will be phased in over two years, and new fees will be implemented for re-inspections and re-reviews of development plans. Lawmakers return to Washington, D.C., this week after spending time in their districts. Several measures have been introduced that are important to NAIOP and commercial real estate. The Carried Interest Fairness Act of 2019, introduced in the House by Rep. Bill Pascrell (D-NJ) and in the Senate by Sen. Tammy Baldwin (D-WI), aims to treat certain income currently taxed at the capital gains rate as ordinary income. This would be a major change, since the top capital gains rate is 20 percent and the highest rate on ordinary income is 37 percent. Less than two years ago, Congress passed the Tax Cuts and Jobs Act of 2017 (TCJA), a law that NAIOP strongly supported. Lawmakers recognized that taxing carried interests at a lower rate than ordinary income provides the necessary incentive for entrepreneurs to undertake risks inherent in development. The provision was therefore kept in place in the new tax law, though a new three-year holding period was imposed. The three-year holding period was intended to ensure that “carried interests” were used primarily for longer-term capital assets. NAIOP has opposed changes to the taxation of real estate carried interests, and is working with its real estate allies to educate lawmakers in both the House and Senate on the changes already made to carried interest taxation. The Charlotte Planning Department late last week released a revised draft of its proposed Transit-Oriented Development (TOD) Ordinance, ahead of a March 18th public hearing. REBIC is in the process of reviewing the ordinance, which is available for download HERE. We strongly encourage any developers considering projects in the City's transit corridors to look through the draft and provide us with any feedback you may have. With a Friday deadline looming, lawmakers in Congress say they have reached a deal on a spending bill that would keep the government open for the rest of the fiscal year. Without an agreement, funding for about a quarter of the federal government would run out on Feb. 15. The spending agreement would reportedly include some $1.3 billion for barriers on the U.S.-Mexico border. That’s far less than the $5.7 billion that President Donald Trump had been demanding. During NAIOP’s annual Chapter Leadership and Legislative Retreat in Washington, D.C., last week, keynote speaker Bret Baier of Fox News suggested a compromise. Baier said Trump probably will not get a physical “wall” on the border, but could get increased funding for border security. He predicted that might be enough for Trump to declare a win on the issue. Encouraging Congress to incentivize energy-efficient construction without imposing new mandates. During the course of the day, NAIOP members met with Senator Thom Tillis and congressmen Richard Hudson and Patrick McHenry. Thanks to those NAIOP members who took time out of their busy schedules to advocate for commercial real estate priorities on Capitol Hill! State legislation passed last month at the conclusion of the 2018 session of the General Assembly means redevelopment sites in Charlotte are no longer required to include on-site stormwater controls if no additional impervious surface is created. A provision in SB 469, a Technical Corrections bill initially vetoed by Governor Cooper but ratified through a legislative override, specifically mandates the change to local stormwater ordinances, regardless of where a local government obtains its regulatory authority. While a redevelopment exemption for stormwater has been state law for years, the City of Charlotte has previously required controls on all projects, citing its adherence to a federal NPDES stormwater permit that called for higher local standards. REBIC has long argued that stormwater controls should not be required on redevelopments where no additional impervious surface is created. The provision in SB 469 also allows development within a vegetative buffer, as long as the runoff from the entire impervious area of the project is collected, treated, and discharged through a portion of managed vegetative buffer. Of course, stormwater controls will continue to be required on sites whenever additional impervious surface is created. The Treasury Department and the Internal Revenue Service issued final regulations regarding the new 20 percent deduction on qualified business income. As Americans begin preparations for the 2018 tax filing season, real estate professionals have been uncertain about the true impact of the 2017 Tax Cuts and Jobs Act on their respective businesses. Friday’s ruling from Treasury and the IRS, however, signaled a significant victory for the real estate industry and for many of the National Association of Realtors®’ 1.3 million members. The 2019 Mecklenburg County Property Revaluation is complete, and property valuations are now online at the Assessor’s website. Look for your Notice of 2019 Real Estate Assessed Value in your mailbox in late January 2019, and remember that this Notice is NOT a bill. Your property tax bill will be determined by the tax rates adopted by Mecklenburg County and the City of Charlotte later this year (probably around July). You can also use the tools on the County website to file an informal appeal if you think your property has been improperly valued. If you disagree with the results of your Informal Review Request, you have a right to file a Formal Appeal to the Board of Equalization and Review. You may request an appeal any time prior to the adjournment of the Board of Equalization and Review or within 30 days of your Notice of 2019 Assessed Value. All requests for appeal must be made in writing and on the proper form. The new Congress in Washington, D.C., features plenty of new faces, with Democrats controlling the House of Representatives for the first time since 2010. But the new class will be dealing with some old problems as 2019 begins. Also, the lame duck Congress failed to address some technical mistakes it made when writing the 2017 Tax Cuts and Jobs Act. For example, when they were writing the bill, lawmakers wanted to allow real estate businesses to depreciate Qualified Improvement Property (usually expenditures associated with interior tenant improvements) over a time span of 15 years. Instead, because of a drafting error, the law as written imposes a 39-year depreciation schedule. NAIOP is part of a coalition encouraging the administration and lawmakers to fix that mistake. Congressional lawmakers in both parties acknowledge the mistake and want it fixed. Before the outgoing Congress wrapped up, former House Ways and Means Committee chairman Kevin Brady released a draft reform bill for discussion. The new chair of the committee, Richie Neal (D-MA), says he wants to hold hearings to discuss the tax law. But making any technical corrections will require passing a new law, and it isn’t clear when that might happen. The City of Charlotte has set a February 25th Public Hearing date for a new Transit-Oriented Development (TOD) Zoning Ordinance, despite a key Building Height Bonus provision still undergoing revision. REBIC and other industry groups have worked with City staff on the draft for more than a year, as part of a comprehensive stakeholder review process that has seen a number of restrictive provisions pared down or eliminated. But the Building Height Bonus provision, intended to encourage the construction of Affordable Housing units along transit corridors, was only unveiled on December 13th, and has yet to be modeled for effectiveness. The Height Bonus, which is designed to advance City policy priorities such as affordable housing, open space preservation and sustainability, will give developers the opportunity to amass points that can be used to increase their building height. It would allow buildings to rise as high as 300′ in the highest-density TOD district when the maximum amount of points are obtained. Developers would also be able to increase their building height by paying a fee-in-lieu that that would go into the city’s Housing Trust Fund. Thanks are due to the North Carolina Home Builders Association (NCHBA) and State Representative Dean Arp (R-Union) for their support of this critical legislation! Lawmakers return to Washington, D.C., this week to continue their post-election lame-duck session. It isn’t clear exactly what issues they will deal with, but taxes and spending are major concerns. One key issue that NAIOP continues to focus on is the need to fix some clerical errors in the 2017 tax reform bill. NAIOP is part of a group of hundreds of organizations and businesses pressing for a technical corrections law. This would require a majority in the House and at least 60 votes in the Senate, so it would need to be bipartisan. Lawmakers on both sides of the aisle have indicated they understand the need for action on at least one issue: Qualified Improvement Property. Lawmakers also face a December 7 deadline to fully fund the federal government. They passed, and President Donald Trump signed, a partial budget in September, just before the 2019 fiscal year began. Time is of the essence when it comes to completing the spending bill, as there are only about 12 legislative days available in the lame-duck session. President Donald Trump and Republican lawmakers are promising to pass legislation to deliver further tax relief for the middle class. “Business will not enter into it, and this will be on top of the tax reduction that the middle class has already gotten, and we’re putting in a resolution probably this week,” Trump told reporters in the Oval Office last week. Lawmakers are out of session until after Election Day, Nov. 6. Rep. Kevin Brady, chair of the Ways and Means Committee, said, “We will continue to work with the White House and Treasury over the coming weeks to develop an additional 10 percent tax cut focused specifically on middle-class families and workers, to be advanced as Republicans retain the House and Senate.” Brady also hinted Republicans may cut government spending if they retain the House. Charlotte has an Affordable Housing crisis -- it's an undeniable fact. Our crisis is not unlike those faced by dozens of American cities, large and small, where a limited supply of land and rooftops pushes rents and home prices out of reach for many. It's a unfortunate byproduct of our own success, driven by the growing appeal of a city that continues to attract more than 40 new residents a day with our high quality of life, temperate weather and strong job market. What is also undeniable is that the need for affordable housing exists across much of the income spectrum. The U.S. Department of Housing & Urban Development (HUD) pegs the Charlotte MSA's Area Median Income (AMI) right around $74,000. Using the rule of thumb that no one should spend no more than 30% of their gross income on housing, a family of four earning 80% of AMI ($56,550 a year) could pay a maximum of about $1,400 a month in order to avoid being what the government considers 'cost burdened.' On the lower end of the income spectrum, a family of four at 30% AMI ($35,350) shouldn't exceed about $883 in monthly housing costs. Potential investors are getting some clarity about how they may use Opportunity Zones to reduce their capital gains taxes. Last week, the Department of the Treasury released proposed rules for the zones, which were created as part of last year’s tax reform bill. Earlier this year, Treasury had approved opportunity zones – communities that have been identified as economically disadvantaged – in all 50 states, the District of Columbia and five U.S. territories. “We want all Americans to experience the dynamic opportunities being generated by President Trump’s economic policies. We anticipate that $100 billion in private capital will be dedicated towards creating jobs and economic development in Opportunity Zones,” Treasury Secretary Steven Mnuchin said. CALL TO ACTION: Get Out & Vote! 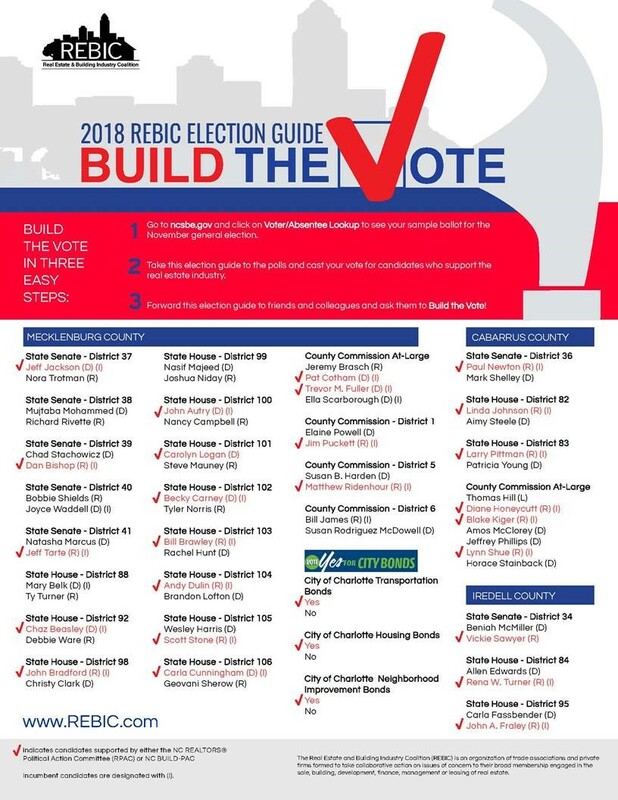 REBIC has put together an Election Guide to help you cast your vote for candidates who support the real estate industry. See which candidates REBIC has endorsed. View early voting times and locations. Lawmakers in both parties are beginning to understand the real-world consequences of a drafting error in the 2017 Tax Cuts and Jobs Act and are asking for a fix. Last week, a group of 12 Senate Democrats sent a letter to Treasury Secretary Steven Mnuchin urging action on the tax treatment of Qualified Improvement Property (QIP). A similar letter from 58 House Republicans was also delivered to Speaker Paul Ryan. QIP is broadly defined as improvements to an interior portion of a commercial building. These include tenant improvements or an office build-out. Kevin Brady, Chairman of the Ways and Means Committee, has promised to introduce and advance a technical corrections bill in the lame duck session of Congress, following the November midterm elections. But with Republicans’ majority in the House in jeopardy, it remains unclear whether Democrats will be willing to help move the bill before the end of the year. A total of 283 groups including NAIOP are asking the Trump administration to swiftly address particular drafting errors that were made in the Tax Cuts and Jobs Act before it was signed into law last year. In a letter sent to Treasury Secretary Steven Mnuchin, the groups asked specifically about two provisions: those dealing with qualified improvement property (QIP) and net operating losses (NOL). QIP is a central concern for NAIOP, as we strongly support a shorter depreciation schedule. “Should the law be left unchanged, a real estate firm investing $5 million to renovate its property would lose out on more than $100,000 each year in deductions, money that could be spent on hiring new staff, or reinvesting in the business,” wrote NAIOP Chairman Jim Neyer in an op-ed for the Cincinnati Enquirer. “Worse yet, companies might decide to hold off on these projects,” Neyer warned. The group letter makes a similar point. “The delay in correcting these provisions has caused economic hardship for some retailers, restaurants, members of the real estate industry, and suppliers of building products, and is also delaying investments across the economy that impact the communities in which these companies are doing business,” it says.